United Fire Safety Co. Inc., supplies a full line of injection molded industrial hose nozzles and fittings. All of our fire hose nozzles and fittings are precision molded from the finest materials on the most modern high-pressure machines. 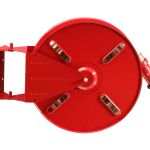 We also supply hose storage reels, reinforced vinyl hose and extinguisher covers, valve caps, adapters, and spanner wrenches. If you have any questions, e-mail us at frank@unitedfire.com.